I admit it. I do. Lately, we have been feeling quite a bit sad and helpless. Helpless, as well as, overwhelmed. Overwhelmed with circumstance, responsibilities, diagnoses, and life right now. Pretty darn emotionally exhausted and super tired physically. When last I blogged, I asked you to pray for Cannon’s Endoscopy. I shared the strategic battle plan of prayer that I had been praying over his G.I. doctor. Well, we got answers. Lots of them. And as usual, it’s complicated. That’s our Cannon! Let me begin by backing up slightly. 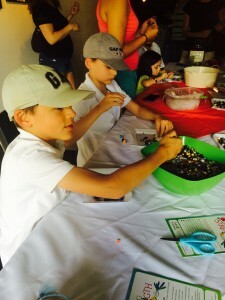 About a week prior to Cannon’s scope, the boys and I went to our beloved Beads of Courage for an event. 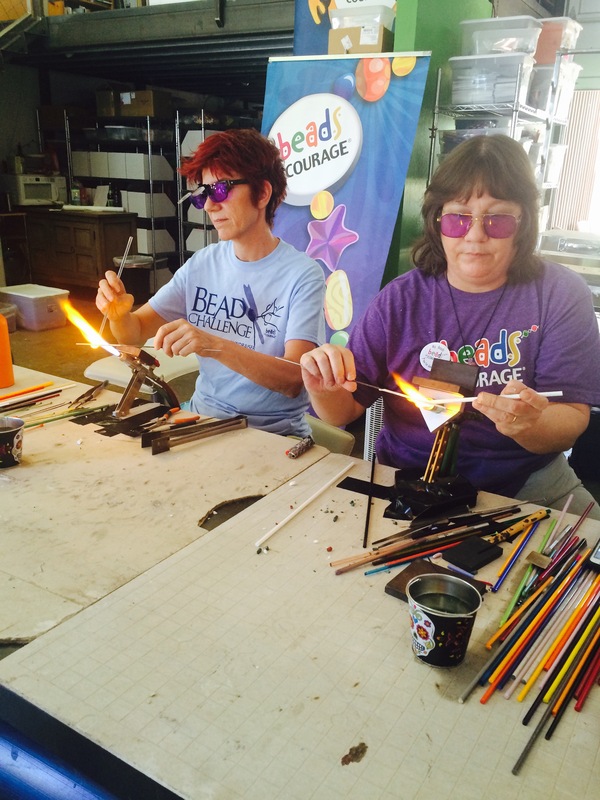 We enjoyed Bead Challenge Day where, among other things, we watched talented bead artists make tons of beads to fill BOC’s Bead Pharmacy. The event took place at various locations across the country. 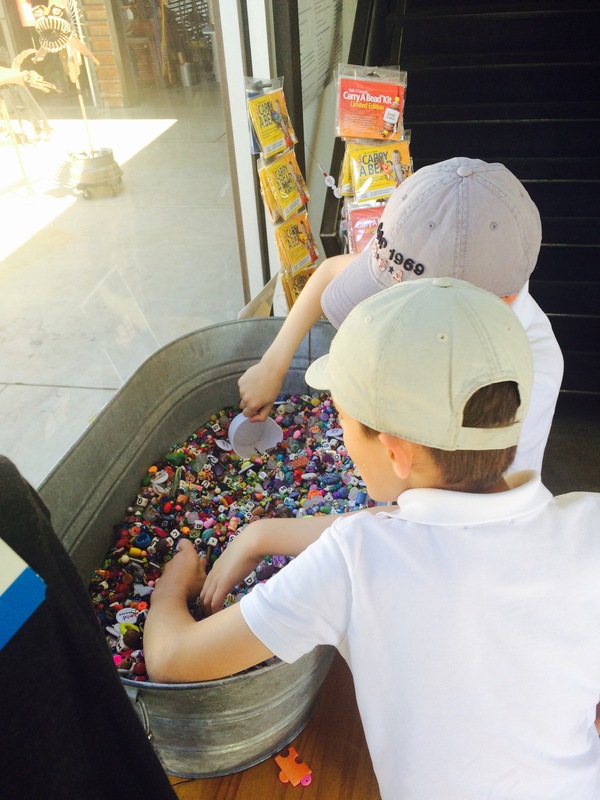 One of the things we did at the event was string some beads onto bracelets. We struck up a conversation with a young woman and her mother seated across from us. During the convo, she shared her diagnosis. Gastroparesis. Remember that one blog family? It was what Cannon’s doctor feared he had last year and was our reason for going to the hospital in Ohio. Where they specialized in it. They did 2 tests for the disease while we were there. One test couldn’t be completed as Cannon ripped the precisely placed tube out upon waking from anesthesia. The other was done and completed. The Gastric Emptying Study. It had a normal result. They told us this was definitive. He did NOT have Gastroparesis…..but Functional G.I. Disorder instead. I told this young woman our story and she kind of laughed. She said she had had 4 of those studies. 2 that were positive for Gastroparesis……2 that were negative. Since it is a relapsing condition….partial paralysis…..sometimes the stomach works and sometimes it doesn’t. If you do the study when all is well…..it will be negative. If you do it when all is not well…..it may be positive. So, bottom line……the test isn’t fool proof. She had the feeding tube to prove it. I found this conversation very enlightening. When we left Ohio in February, I felt okay with what they had told us. 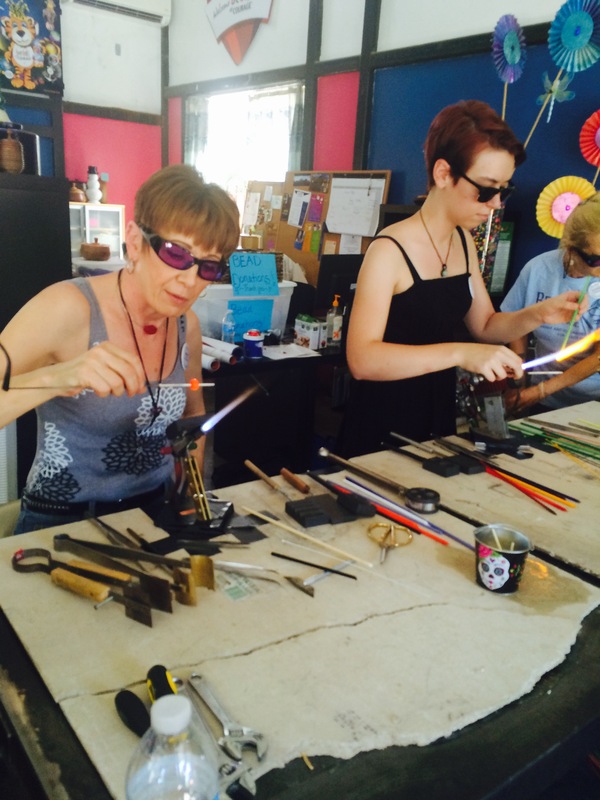 Although, I was surprised….as Gastroparesis had really made all the pieces fit together. I was thankful to have met this young woman. It put this thought back in my mind and allowed what came later to not be such a shock. Back to the recent scope. Afterwards the doctor came in (just like last year) shaking his head. And again (just like last year) asked me when Cannon had last eaten. I remembered exactly and we did the calculations. 17 hours prior. He revealed to us that Cannon’s stomach was STILL full. I gasped and teared up quickly. My poor baby! How miserable this must feel. Eventually I got out a question. “Does this mean he definitely has Gastroparesis?” He said, “There is still food. There is Gastroparesis.” My heart sank. Another life long, chronic condition. That was bad enough……but there was more. Reflux. But not just any old bout of reflux. Horrific. Major damage. He actually said that from what he saw “we are weeks away from losing his food pipe.” LOSING HIS FOOD PIPE?! This news was almost beyond my comprehension. Prior to our trip to Ohio, Cannon was on 3 doses a day of reflux medication. While there, they informed us that the sole goal of a reflux med was to protect the esophagus. And that 1 dose a day would do that. 3 was excessive. So, we listened and eliminated 2 doses. One of our reasons for going there was to edit medications. We knew he was over medicated at that time. We tended to add to the regiment constantly and never take any away as issues improved. So, we listened. And now…..this news. It was tough to take. He informed us we absolutely HAD TO put him back on the 3 doses immediately or else…… So, of course, we have. And there is more. He is terribly concerned about aspiration. So much so, we will be seeing a Pediatric Pulmonologist soon. He said several times (almost in disbelief) that he had seen it happening with his own eyes through the scope. Instead of fluxing acid like what is normal with acid reflux….and because his stomach is often full of food for long periods of time….he is fluxing the food. He has a great fear that he will aspirate this food and we will be in real trouble. He told us we need to have eyes on him at all times…..particularly at night when reflux is at his worst. Getting a new video monitor for his room was a must as well as propping up the head of his bed considerably. Making sure to feed him early in the evening…..at least 3 hours before bed. Smaller more frequent meals are best. A week later, we heard back from the biopsies taken that day, as well as the lab report. The labs showed low iron. Which shouldn’t be as he takes iron 3 days a week. So, we had to increase the frequency of that supplement. P.S…Iron is very hard on your stomach. No bueno. AND the pathology report showed something called Eosinophilic Esophagitis (EoE). This was explained to me as “asthma of the esophagus.” It can be the result of reflux or allergy. The pathologist noted that the findings were consistent with allergy. The treatment…..more diet restrictions. Most of which we already eliminated…..dairy, wheat, gluten, soy, corn, and eggs. I had a good cry after hanging up the phone from hearing “Eliminate peanuts, tree nuts, fish, and shellfish.” Cannon LOVES almonds for snacks, and devours peanut butter. Salmon is also one of his most favorite things on earth. BOO! He already has so many restrictions. It kills me to take away foods that make him happy. The plan is to eliminate these things for 3 months and then get another scope. If all is better at that time, then we can add back in ONE of the eliminated foods. 3 months later…..another scope. If all is still well….another food added back and later… another scope. And so on. We also have to see our allergist to get a highly specialized allergy test. The other thing the nurse reminded me on the phone that day was that now that Cannon is back on all the reflux meds…..he has to go back on the FODMAP diet. When you are killing ALL the acid in your stomach via meds…..it can become a breeding ground for bacteria. So, he has to take an antibiotic for that and eat in a way so as not to feed that bacteria. Bottom line…..between the 2 diets I have 15 pages of diet restrictions to cross check before feeding my child. Hence the previously mentioned overwhelm. All of this is a lot to take and I’d be lying if I said it has not been a taxing and emotional time. To boot, Mark’s crazy work schedule requires me to always be the one to get up with him at night. Cannon’s button has begun leaking badly and we have had to increase the agitant in his daily flush which has made him nauseous again. And on a whole other note, we are facing a 20% pay cut after the 1st of the year. The hardest part, though, has been seeing Cannon in so much pain. He has bursts of energy at times. And we are so thankful for that. He can go outside and play for a bit. But he tires quickly and often needs to be carried after that. He, sometimes, does ok in the mornings after the flush until about noon……he goes into a free fall. I would say 80-90% of the time, he is telling us he hurts. His eyes are terribly sad. He also isn’t sleeping well AT ALL. He gets up frequently during the night to tell us he is hurting. And there isn’t much we can do but give him right now…..Tylenol or Ibuprofen. IT IS SUCH A HELPLESS FEELING!!!!!!! But, let me be clear……we feel HELPLESS but we are NOT HOPELESS! 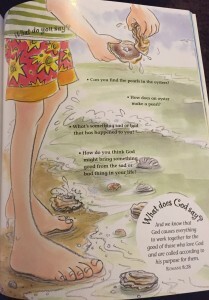 Last night, I was reading our devotion to the boys from a book called My Big Book of 5 Minute Devotions. 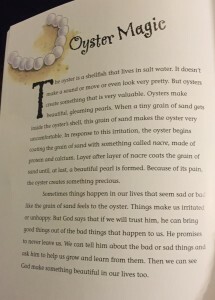 It was about the process of how the oyster produces the pearl. Through struggle, discomfort, and irritation comes this thing of incredible beauty. Out of bad comes good. Purpose from pain. I was thankful to share these words with my little loves last night. Anyhow, I think that is all. I’m sure I have forgotten something cuz this mamma is wiped the heck out! But, this is most of it. Our battle plan of prayer will now evolve to fit our current needs. (More on that soon.) Our top priority at this time may sound strange. It’s to be broken. To let it out. To be real with my God. Vulnerable. To come to terms with these new words in our vocabulary, make ALL the necessary adjustments, and then move forward. With strength, acceptance, and the constant goal of giving Cannon the best, most healthy life possible. We will be ok. I leave you tonight with this song I came across recently. It is the words/heart of a lovesick Father…..begging for closeness with his child. Yearning to be trusted in hard times. Allowed to take over. Our family was built on faith and on that we WILL stand. God bless you blog family! Thank you for caring! We love you!